Today started with a walk around the French Concession area of Shanghai. 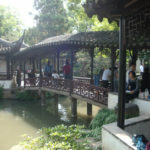 The neo-classical buildings and beautifully manicured gardens made it feel as though I had stepped out of Shanghai and into France. 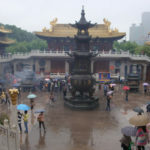 After walking through the Fuxing Park, I headed for the busy tourist streets around the Yu Gardens, and following lunch, it was time for the highlight of my trip to Shanghai – watching the film crew in action shooting scenes for Dream Big. I met the crew atop the Hotel Indigo, just across the Huangpu River from the Shanghai Tower. There were cameras of all kinds set up, in the hopes of capturing the perfect shot for the film. The crew uses a special camera to shoot in super-high resolution IMAX format, and the camera alone takes several people to carry. Watching even a few minutes of the filming process shows just how much work is going into making Dream Big a reality. One of the producers told me that for every 50 shots they take on location, only one will make it into the final cut of the film. 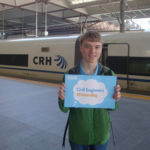 The next day, I started with a visit to the Shanghai Urban Planning Museum, where I learned more about the rich history of Shanghai, and how it has influenced the city that I am exploring on this trip. Of particular interest was the model of the city, which took up more space than the average two-car garage. Intricately detailed, the buildings in the model even lit up as the model changed from day to night. 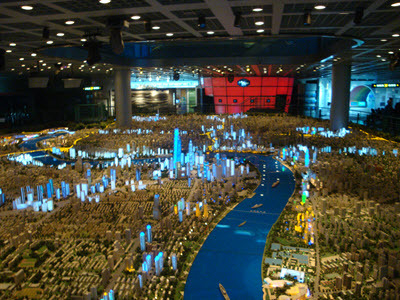 The museum also featured exhibits on Shanghai’s geology, as well as on the massive system of subways, trains, planes, and buses that connect Shanghai to the rest of the world. After the museum, I met with one of the Dream Big producers at the Shanghai Tower, where we were fortunate to be able to access the 37th floor garden for some pictures with the students from Tongji University. Being in the Shanghai Tower, the second-tallest building in the world, was an experience I won’t soon forget. The engineering that went into creating the tower is simply remarkable, and the tower is a true testament to the work of the people in our profession. 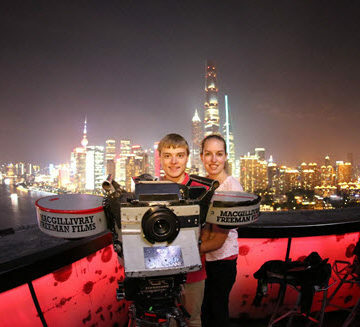 After visiting the tower, we returned to the Hotel Indigo for a time-lapse shot of the Shanghai skyline as the sun set below the horizon and the buildings lit up in every color of the rainbow. Finally, we went to the Oriental Pearl TV Tower for some shots of perhaps Shanghai’s most recognizable building and the psychedelic light show the building puts on each night. 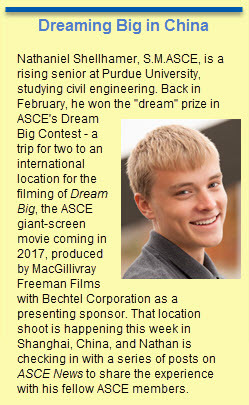 After spending the day learning about the filming process for Dream Big, I am even more excited to see the final product when it comes out Feb. 17, 2017.